GoLang core packages support most of HTTP out of the box. 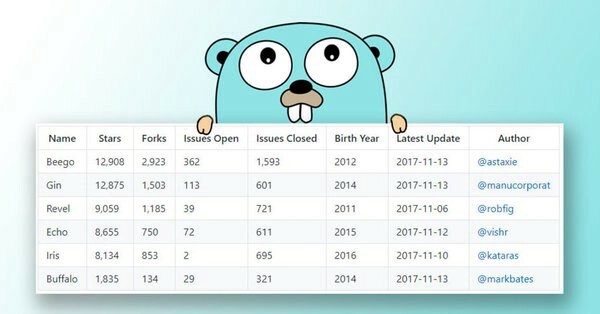 Still, there are useful libraries, or even frameworks that can help making web apps better in Go. Gorilla/mux: A powerful URL router and dispatcher for golang. Beego: An open-source, high-performance web framework for the Go programming language. Buffalo: Rapid Web Development w/ Go. Echo: A high performance, minimalist Go web framework. Gin: HTTP web framework written in Go (Golang). It features a Martini-like API with much better performance. Iris: The fastest web framework for Go in The Universe. MVC fully featured. Embrace the future today. Revel: A high productivity, full-stack web framework for the Go language. tbrand/which_is_the_fastest: Which is the fastest web framework?